1900 A chapter of the Newman Club was established on the campus of the State University of Iowa. 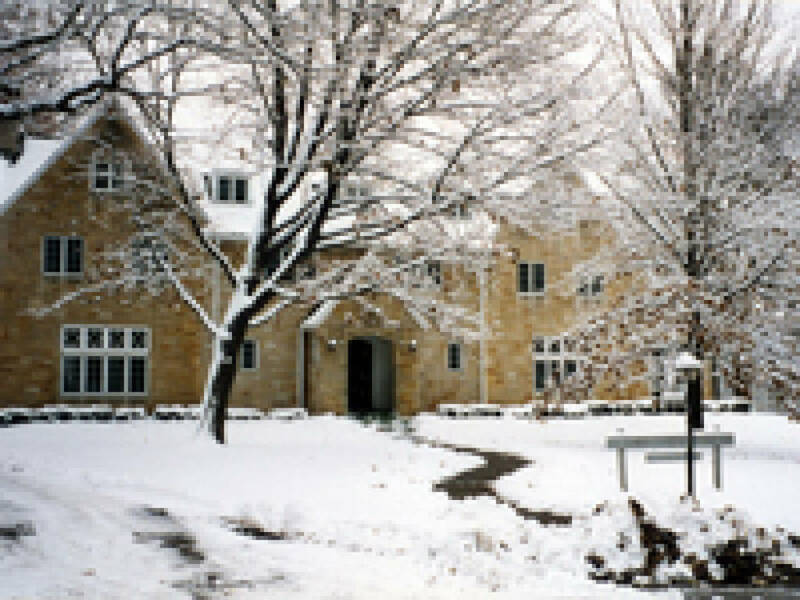 1928 Student center, now the rectory/parish center, was built by Psi Omega, a social fraternity. 1935 St. Thomas More, the patron saint of lawyers and students was canonized. L.H. Barnes, a portrait artist, prepared a portrait of St. Thomas More which hung in the reception hall of the original student center. 1936 A Catholic foundation was established on the U of I Campus (the first in this country in a secular university or college). 1939 Number of Catholic students at State University of Iowa increased to 600. Newman Club members numbered 270. 1940 Bishop Rohlmann purchased the Psi Omega Fraternity House to be used as the Catholic Student Center. Father Brugman envisioned that the University was moving west. 1943 First Mass was celebrated in rectory lounge. 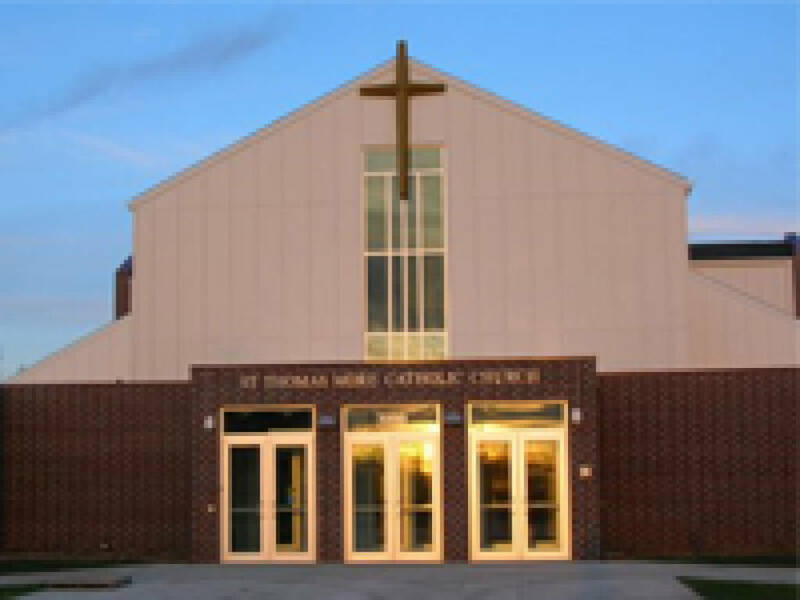 1944 St. Thomas More was incorporated by Bishop Henry Rohlmann as Catholic Student Center. Fr. Robert Brugman became pastor. 1945 Plans announced for an expanded Catholic Student Center. Plan strengthened when Fr. 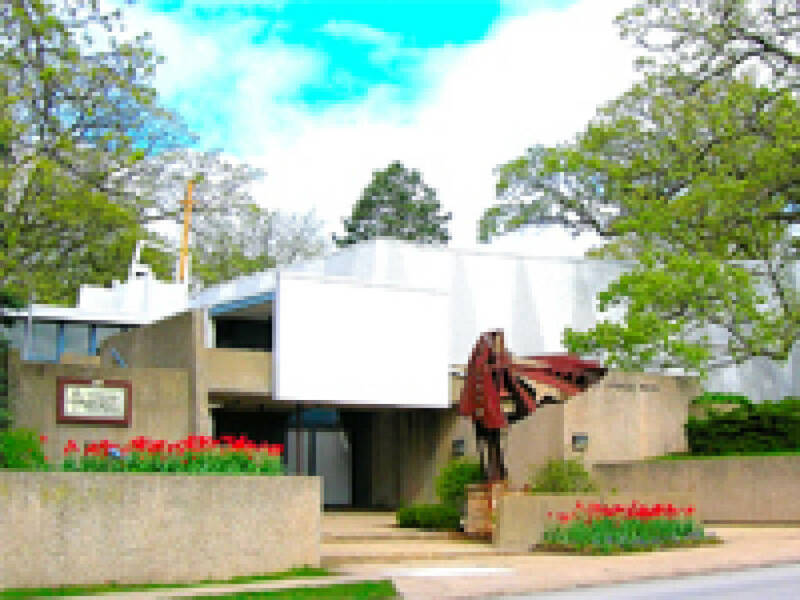 Brugman was authorized by Bishop Hayes to purchase a building site in the 400 block of Riverside Drive which was close to the center, 108 McLean Street. Fall, city council of Iowa City deeded the land in the ravine to St. Thomas More Church with the stipulation that a path be constructed to the new lot. 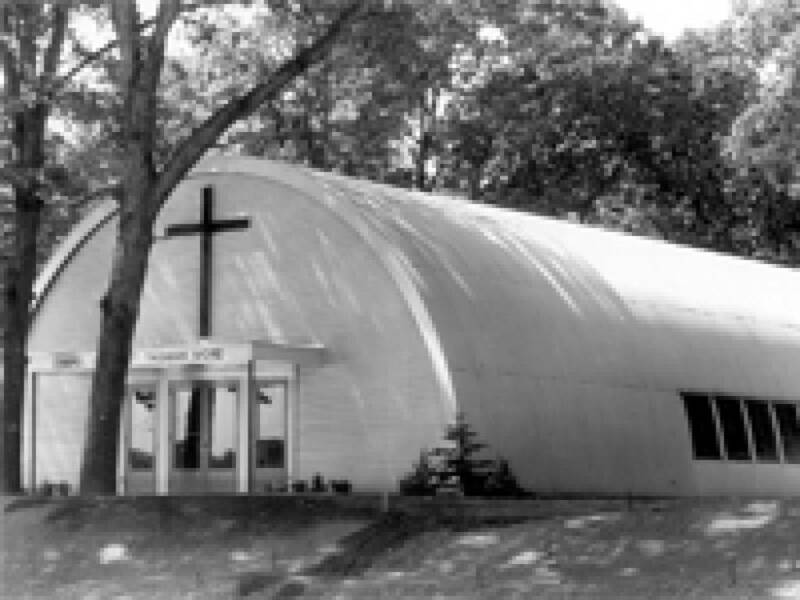 1946 December, Bishop Hayes directed the center to build a Quonset chapel as a temporary solution. 1947 April, Quonset construction began. June, Joseph DeLauro, a U of I MA student, sculpted statues of St. Joseph, Mary, and Child for Quonset chapel. July, chapel was opened on the Feast Day of St. Thomas More. October, blessing of the chapel by Bishop Hayes. December, plans revealed for a new modernistic church. 1950 Basement of student center remodeled to provide a large kitchen and a lounge for students. 1952 Monsignor D.J. Conway became pastor. House next to student center purchased to be used as a convent. 1955 Plans were in place to move Student Center to east side of the river. 1962 Fr. J. Walter McEleney became pastor. 1964 A list of permanent adult members of St. Thomas More numbered 421. 1965 Catholic student population at U of I had increased to 2,900 in fall of 1965. Construction of modernistic church began. 1966 New church opened. Seating capacity of 700 in church; 300 in space in lower level rooms. 1967 Church dedicated by Bishop O’Keefe. 1968 Fr. Andrew Barry became pastor. 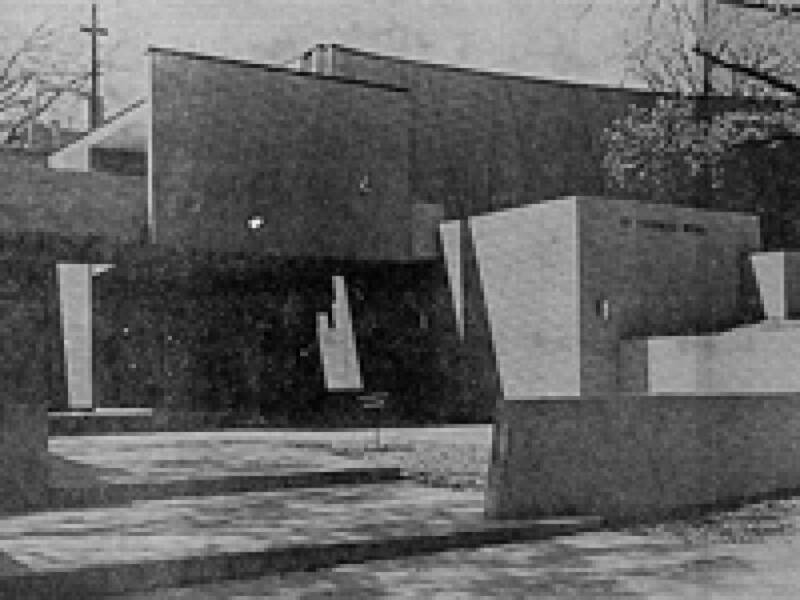 1969 Student Center moved to St. Mary’s School building. Parish Council formed and Lay Ministry Program initiated. Co-operative nursery for infants through preschool opened. 1970 Student Center became a separate entity. Nursery and activity hour began at the new church. 1973 Fr. Robert Walter became pastor. 1978 Fr. Joseph Sparks became pastor. 1981 St. Thomas More Playgroup for parents and their young children began. 1987 Fr. Robert Busher became pastor. 1989 Fr. David Hitch became pastor. December, 796 households make up the St. Thomas More Parish membership. 1989 Students from the Newman Center still help us in the preschool through grade nine Religious Education program, which now numbers over 500. 1995 The four Iowa City parishes collaborate to buy land in Coralville for $200,000 as a site for a future parish. Parishes asked to reach consensus about how a future parish would be established. 1998 Catholic Community self-study indicates 20% of its members live in NW Corridor. 2000 Fr. Walter Helms became pastor. 2004 Parish voluntarily discusses relocation possibility through open meetings process. Referendum vote of parishioners results in 60% for - 40% against moving. 2005 Bishop William Franklin moves to resolve issue of new parish in NW Corridor area by asking St. Thomas More to be the parish to relocate. Parish Council decides to accept and move ahead with the decision. Steering Committee established with John LePeau as chair. Occasional summer Sunday evening Masses at North Liberty Community Center and, later, monthly Saturday evening Masses at United Methodist Church on Jones Blvd. in North Liberty. Religious Education classes extended to N. L. Centro Offices on Monday nights. 2006 Planning process continues with liturgical consultant Michael DeSanctis conducting parish meetings to educate, inform, and develop concept of new parish design. 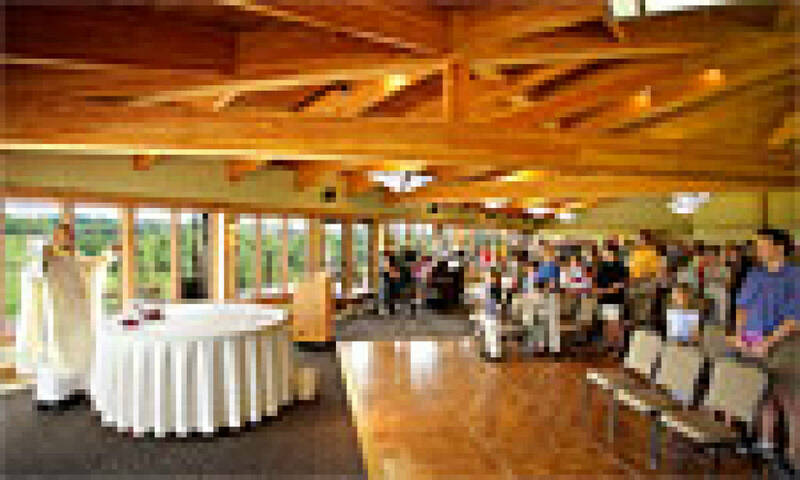 2007 Sunday 8:30 Masses at Coralville Brown Deer Golf Course Clubhouse. Capital campaign raises $1.8 M in pledges. Church and parish center marketed. University purchases church building for $1.2M. Parish Center in process of being sold. BVH from Omaha and Neuman Monson hired as architects. Miron Construction hired as builders. 2008 Ground breaking at new site on Sunday, June 22. Bishop Martin Amos blesses ground with 500 in attendance for the special Mass. Construction begins on $5M+ structure. 2009 University remodels current church as organ and music concert hall while weekend Masses continue. Religious Education program students now top 320 students. Bishop Amos dedicates new church Saturday, November 14. 2013 Reverend Stephen C. Page is installed as the new Pastor.